Sometimes it’s hard to shop for my husband, John. His list is usually short and includes some kind of several-hundred-dollars tool or like a $3.99 thing from Amazon. While it’s nice to have an idea of a fun splurge gift for him and a couple things to put in his stocking, I like to find things for him that are a mix of both quality and quantity - it’s more fun for ME to watch him open a few gifts on Christmas morning rather than one big gift. Do you find yourself in the same boat as me? 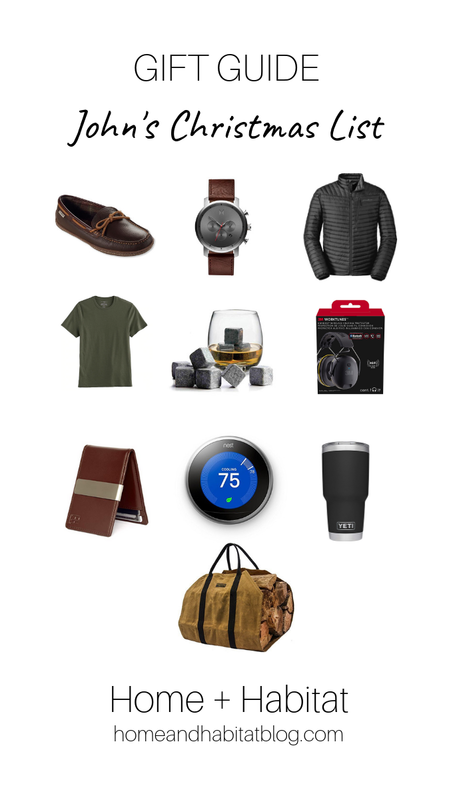 Racking your brain for “Gifts for Him”? Well, look no further. Straight from the horse’s mouth, I bring you John’s Christmas list. Some things he already has that are tried and true while other things are still on his wish list. Here is a mix of gift ideas that the guys in your life are sure to get excited about this Christmas. Scroll down to shop the direct links below! Leather Slippers $49. I gave these to John last year for Christmas and he loves them! They have held up like a dream and have a rubber sole. MVMT Watch $135. John has had his eye on this beauty for a while. Gorgeous! Down Jacket $135. Eddie Bauer has THE BEST quality outerwear on the market and an equally incredible lifetime guarantee on all of their products. If for any reason you are unhappy with a product, you can return or exchange with no questions asked. Oh! And they almost always have 40% off sales. I’m a fan. Ultimate Heather Tee $6. John is VERY particular about his tee shirts. This $6 one is hands down his most favorite. Soft, the perfect cotton weight, the neck and arms don’t stretch out and it comes in 16 different colors. Time to stock up! Whiskey Chilling Stones $8. Sheets, white. Whiskey neat. Coffee, black. That’s how we like it. These granite stones keep his whiskey chilled without diluting that golden nectar with melting ice. Work Headphones with Bluetooth $40. John bought these a few months ago and he has loved being able to listen to music or podcasts while he works in the yard or in the garage. I like that his eardrums are protected from loud tools and equipment. Win win. Slim Leather Wallet and Money Clip $30. A good, slim front wallet can never be understated. This one comes in a few different fun colors, too! Nest Learning Thermostat $180. Is this a want or a need? I say both! How convenient to not have to get out of bed to adjust the thermostat! Adjust that dial right from an app on your phone. And the Nest will save you money by learning your temperature preferences throughout the day. Yeti Rambler $55. Perfect for the 2-cups-a-morning coffee drinker and the water guzzler alike. John and I to a T, respectively! Waxed Canvas Log Carrier $70. A practical gift that he will use all winter long. This log carrier holds more logs than he may be able to carry in one arm load and won’t snag the elbow creases of that down jacket (above) that you ordered for him! Wink wink!